You probably won’t find a yellow-bellied sapsucker in Montana, but tundra swans, snow geese, bald eagles, waterfowl, songbirds, and dancing sharp-tailed grouse abound if you know where and when to look. 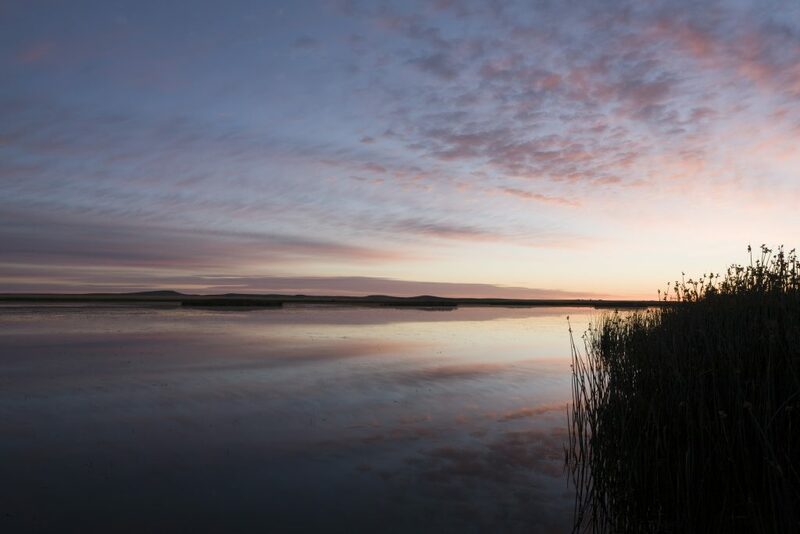 Located 12 miles north of Great Falls, Benton Lake isn’t really a lake, but rather a marshy wetlands area brimming with native grasses and wildlife. Springtime is perfect for viewing eagles and other raptors as well as migrating tundra swans, mallards, pintail ducks, and other water lovers. 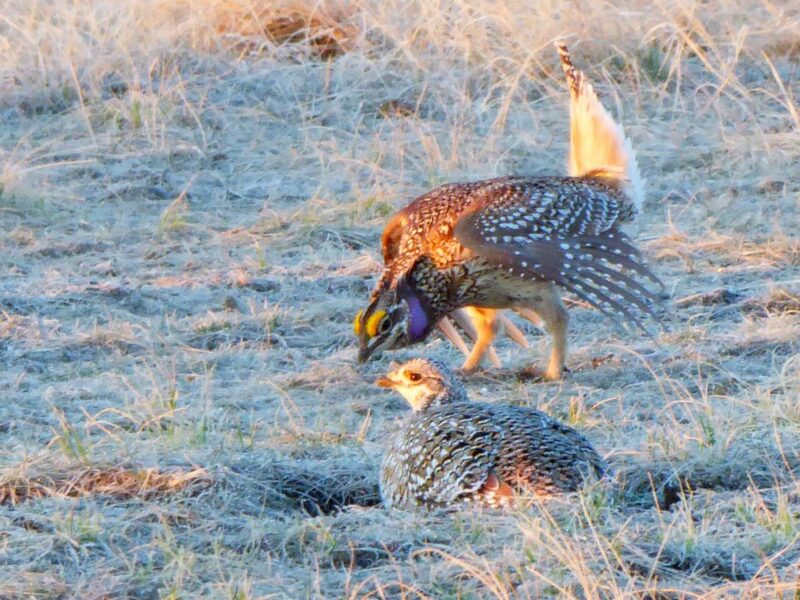 For a closeup view of the sharp-tailed grouse mating dance, visitors can reserve a viewing blind in April and May (Thursday-Sunday) to watch the sunrise over the lake. Males ruffle their feathers, stick their tails in the air and make a drumming noise as they run around in circles hoping to impress potential mates. Those interested in seeing this spectacle should send an email or postcard in early March with up to three preferred dates. Details can be found on the website. Spring is not the only season active with wildlife. The refuge hosts waterfowl year-round: Summertime brings nesting and wading birds such as avocets and curlews to the marsh along with songbirds and owls. Fall gives way to migration, as flocks fly south to warmer ground, leaving just a few songbirds, owls and raptors to survive the winter. Visit the refuge’s website for more information. You don’t have to go far to view an amazing show of feathered friends. The Upper Missouri Breaks (UMBA) Chapter of the Audubon Society holds several bird strolls, some along the River’s Edge Trail and Giant Springs State Park, excellent places to see a variety of waterfowl, raptors, and songbirds. From orioles to pelicans to bald eagles, many species take advantage of the Missouri River for water, food and the shelter its banks provide. Those who would like to become a citizen scientist for a day can help Audubon with its annual Christmas Bird Count. Interested individuals will be paired with an experienced member to count and record types and numbers of birds seen Dec. 15. To learn more about local Audubon activities, visit the UMBA website. To participate in the count, visit the contact page and fill out the form. Other places to view birds are parks, particularly Wadsworth, Westbank, Riverside, and Gibson, as well as local cemeteries (Great Falls and Manchester) and fishing access sites (White Bear, Big Bend, Vaughn, Cottonwood). 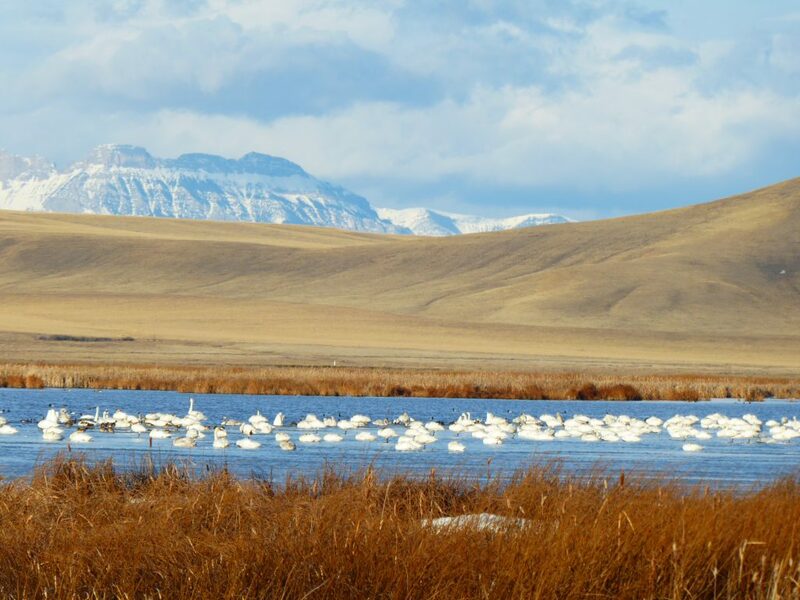 Swirls in the sky; glittering wings in formations–For many, visiting Freezeout Lake (also spelled “Freezout”) in the spring and fall to see the migrating snow geese and tundra swans has become an annual tradition. Against the backdrop of the Rocky Mountain Front with Sawtooth Mountain so prominent, people gather at sunrise and sunset to see thousands of geese take off and land on the lake and the open-water ponds, visible from Highway 89 between Fairfield and Choteau. These majestic white birds with black-tipped wings make a clamor as they rise in unison, swaying in the wind. Visit the website or listen to the hotline message (406-467-2646) to find out the best time and estimated number of birds before you visit. Potential visitors can download a copy of a bird checklist as well. Those who want a little more walking to go with their birding adventure should drive to Rogers Pass in early spring or fall to watch for birds of prey, particularly the golden eagle. The Continental Divide Trail plays host to west winds and thermals, which attract the raptors. The Front is another great place to take a hike and look for our National Bird along with other eagles, harriers, falcons, hawks, and osprey. Plus, Rogers Pass is the perfect stretch break on the way to Lincoln or Missoula. Eagle viewing is just one more reason to get out of the car. Another place to view raptors, particularly golden eagles, is Duck Creek Pass in the Big Belt Mountains near White Sulphur Springs. Visitors are encouraged to bring high-clearance vehicles or walk the last mile and a half to the observation point. Please bring bear spray as grizzlies also inhabit these areas. 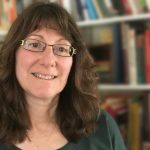 Katie Kotynski has worn several hats in public and private education K-12 and higher education: assessment specialist, adjunct instructor, technology coordinator, journalism and at-risk instructor, as well as a librarian. Now retired from K-12, Kotynski still teaches workshops and adjunct classes at the university level as well as coordinating the state educational technology conference. She has more time to spend with her gals hiking group Girls in Glacier (girlsinglacier.com) Her passion, besides hiking, remains educational technology and writing.